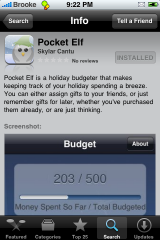 Pocket Elf allows you to set a budget, create a list of friends, assign gifts to your friends (including the amount paid for each gift) and create a list of possible gifts. When you first open the application, you will be on the Budget screen. 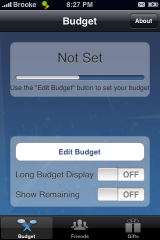 Here you are able to set your budget and then choose how you would like the budget displayed. The default display is how much of your budget you have spent. The Long Budget Display allows you to see how much of your you have spent so far and what your total budget is. 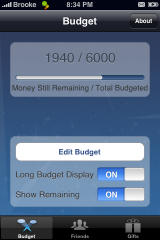 Showing Remaining will display the amount of money still left in your budget. I personally like to turn on both the Long Budget Display and the Show Running options. 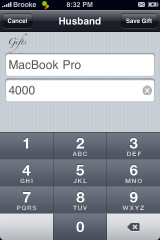 On the lower menu bar, you will notice three options; Budget, Friends and Gifts. 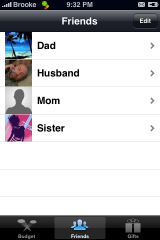 The Friends option allows you to choose friends from your Contact List. 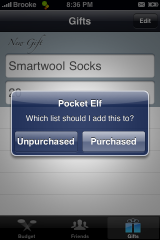 Once you have added a friend to your list, you can then select that friend and enter any gifts that you have purchased for them and the price of the gift. 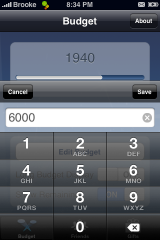 The amount will then be subtracted from your budget amount. I also like the Gifts option. 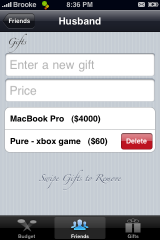 This option allows you to enter gifts that you would like to purchase or gifts that you have already purchased but haven’t assigned them to anyone. The gifts that you add as possible purchases do not subtract from your budget however, gifts added as purchased but undecided are subtracted from your total budget. There are a few things that I would still like to see with this application. 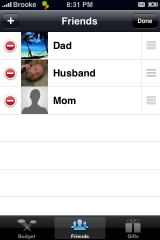 First and foremost is the ability to add items/people to your Friends List who are not in your contacts. This would be nice for things like office parties or similar. 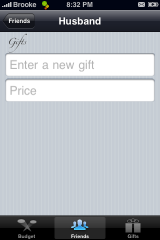 That way, you could enter Office Party and keep track of the gifts your have purchased for that event. 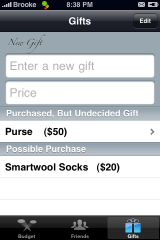 I would also love to see the ability to add notes to a gift, especially the gifts that you would still like to purchase. 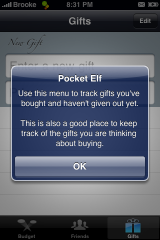 This would allow you to add where you are going to purchase the gift or you could keep track of the cost of that gift from different stores. 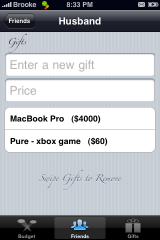 Also, the ability to edit a gift you have already entered would be nice as well but that would most likely come with the ability to add notes to a gift. Overall, I really like this application. I love being able to keep track of my Holiday spending and I like seeing a list of the gifts that I have purchased for family and friends and a list of gifts I still need to purchase. Though, I do have a slight fetish for lists so, this application is perfect for me! It does exactly what I normally would do on paper but on my iPhone! And, it subtracts for me…even better! Hey Brooke, thanks for the review. 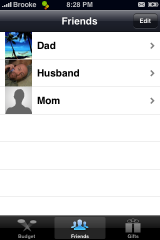 I like the idea about adding contacts that aren’t in the contacts list. I’m surprised I didn’t think of it before release, it is kinda crucial to an app like this. I will be adding it to the next update, which hopefully won’t be in too long. That’s why I wanted this released so early, so I can perfect the application before people really start to get into the Holiday spirit. No problem…I really like the application! You did a great job…it works perfect for me! Keep up the good work. 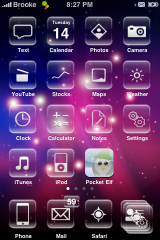 what theme is that you have there?? I love it!